Bigleaf sedge is a perennial rhizomatous species found in North America only in the western US (CA, ID, MT, NM, NV, OR, WA) and in one Canadian province (BC) (USDA 2011). It is found in southern BC, in moist meadows, swamps and bogs in the lowland and montane zones. 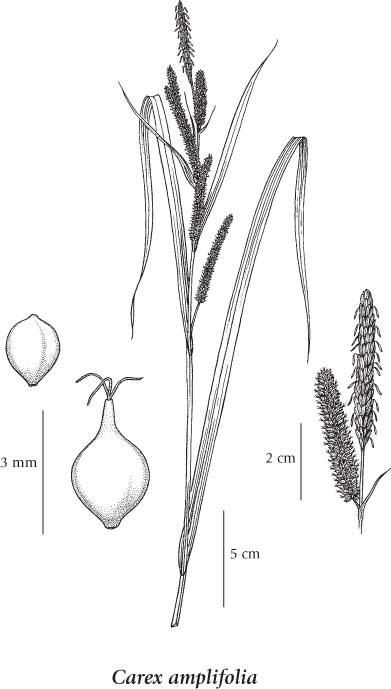 In his article on rare plants of the Fraser Valley, Lomer (2011) says: "This attractive broad-leaved sedge is very local in the Fraser Valley, but rather widespread in southern BC and further collecting will likely prove it is not rare in BC. [In the Fraser Valley], it is most commonly found in the Burnaby Lake area south to the Fraser River, with an outlier population near UBC (UBC: Krajina s.n.). Elsewhere it is known in the Fraser Valley from Clayburn, Maple Ridge and Pitt Meadows. It can be expected in boggy seeps, wet ditches and and other wet sites that are not too saturated year round". Extracted from Botanical Electronic News #432, January 2011, with permission. Culms (stems) are reddish tinted at the base in this species. A detailed species description is provided in Flora North America Online. Perennial, tufted herb from long-creeping rhizomes; stems 30-80 cm tall, equalling the leaves. Sheaths tight, short; blades flat, rough-margined, well distributed along the stem, 8-20 mm wide, the lower ones slightly reduced. Spikes 3 to 7, the terminal one with male flowers, the lower spikes with female flowers, unstalked to short-stalked, 3-14 cm long, interrupted, erect; bracts subtending the spikes leaflike, sheathless, the lower ones longer than the inflorescence, the upper ones reduced. Perigynia egg-shaped, 2.6-3.3 mm long, 1.5-1.7 mm wide, brownish-green, 3-angled, the angles rounded, smooth to somewhat wrinkled, 2-nerved, the beaks about 1/3 the length of the perigynia bodies, slightly bidentate; female scales egg-shaped, shorter or longer than the perigynia, often short awn-tipped, brownish-red, with lighter 3-nerved centres and translucent margins; stigmas 3; achenes 3-angled, granular, 1.4-1.8 mm long. Moist meadows, swamps and bogs in the lowland and montane zones; rare in S BC; S to MT, ID, NV and CA, disjunct in NM.